I love salads! They are the ultimate fast food, I eat all year round and my salads are more than just lettuce, tomatoes and cucumber. 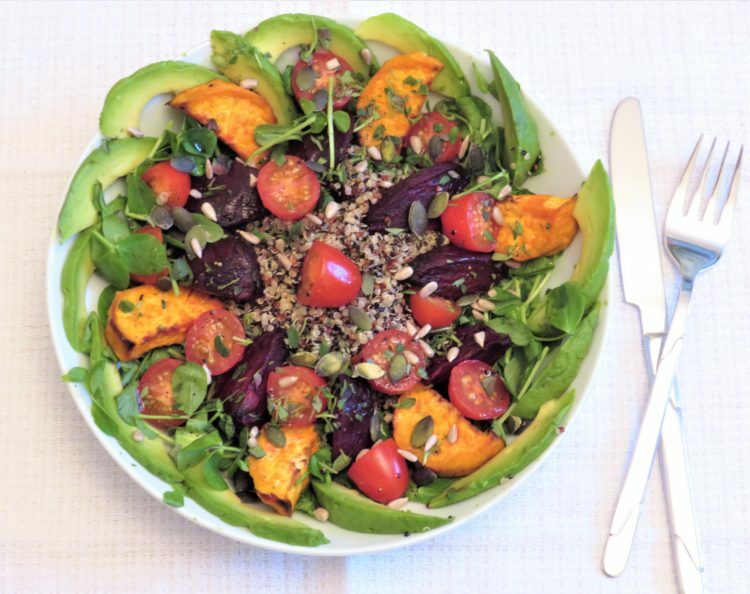 This salad is a typical example that anything can be put into a salad and you will be left feeling totally satisfied. The number one rule of a salad it should be eaten at room temperature and never cold straight out the fridge because you just don’t taste the flavours. 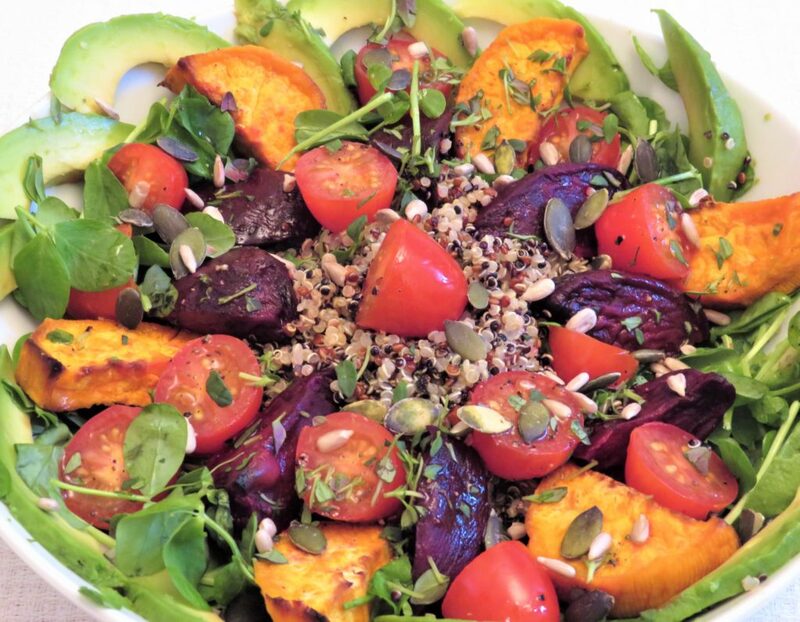 1 Place the sweet potato and beetroot on separate baking trays, spray with the oil, massage and place in a pre-heated oven on 200c/400f/Gas 6 for 15 -20 minutes. Once cooked set aside to cool. 2 Meanwhile, cook the quinoa according to the packet instructions, when cooked set aside to cool. 3 Once the quinoa, sweet potato and beetroot has cooled it is time to plate up. 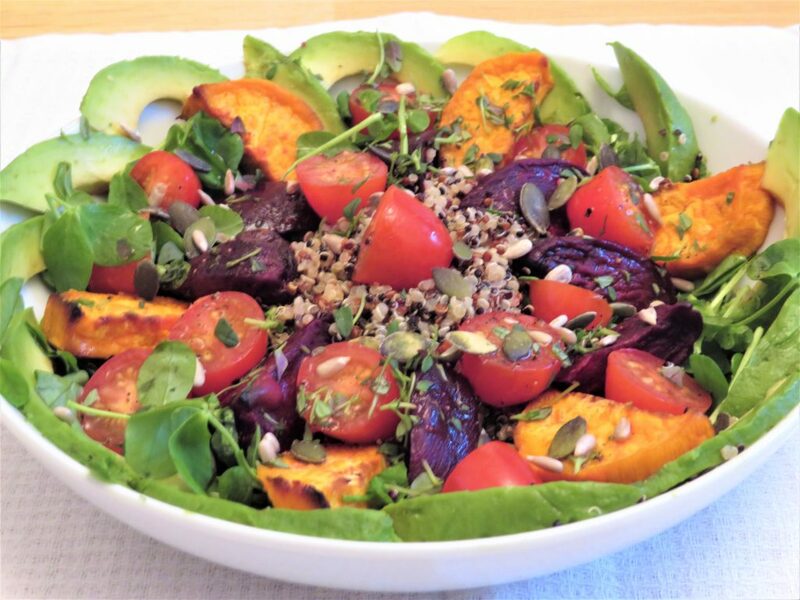 4 Put the watercress in a salad bowl or on a plate then put the quinoa in the middle, then add the beetroot, sweet potato, avocado and tomatoes. 5 Put all the ingredients for the dressing a jar with the lid on give it a shake or in a jug and mix, then drizzle all over. 6 Garnish with a sprinkle of thyme, sunflower seeds, pumpkin seeds and cracked black pepper. Then enjoy! Watercress contains more vitamin-C than orange, more calcium than milk, more iron than spinach, and more folate than bananas. They also contain vitamin-A, vitamin B-6, vitamin-12 and magnesium. It is great for your heart, bones and thyroid health. Lime Juice not only does it cleanse the body of toxins and radiation, it is well known for its antioxidants and anti-inflammatory benefits, it helps strengthen immune system. It is also rich in vitamin-C which has anti-cancer properties, when drizzled on rocket or leafy greens it helps our body absorb the iron.